When a brand has been selected, the remote goes through a simple test that determines which of that brand’s codes will work with your model. Once again only a limited number of codesets are available for each brand, but the test procedure works nicely: it displays the active code on-screen and has you test with the [Power] button (or in fact any of the hard buttons). If one operates correctly press the [Works!] button to save the device, or press [Next] to advance to the next codeset. If none of the codes work, the manual learning option is offered. Up to 18 devices can be configured this way; slightly less at 15 for the Xsight Color. After you’ve finished, the Xsight Touch performs a simple volume punchthrough procedure in case your television or receiver should always be used to control the volume. Next – well, all that’s left to do on-remote, really, is learning new commands. You can opt to learn an entirely new device, or buttons within an existing device. For both choices the remote prompts you to either select a hard button to learn on, or you can add entirely new functions to the on-screen list of soft buttons. Existing keys with preprogrammed commands can be overwritten. New buttons are labeled using the remote’s numeric keypad, in a manner similar to texting on a cell phone (conveniently those keys have been labeled on the remote with appropriate letters). However despite mixed case usage with the LCD’s default labels, only uppercase letters can be entered manually. The somewhat automated entry system also had a habit of automatically adding spaces at just the wrong time. The infrared code learning operation proved reliable, accurately capturing everything I threw at it, but the actual process of learning could be considered rather slow. Each new on-screen button requires 3 button clicks between learns, not counting typing in the label. New buttons are automatically added to the end of the command list, and cannot be positioned or later rearranged using the on-remote software (however more can be done using a computer). Getting down to the good stuff. 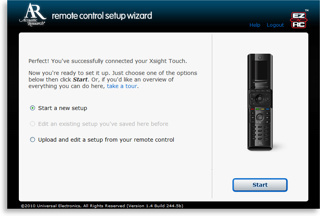 Despite the box implying that it might be possible to configure a reasonably functional remote control without involving the use of a computer, the reality is that the Xsight’s onboard setup is merely a minor convenience. Relying on it solely would result in a purely device-based remote with less customization and convenience features than a blister-packed impulse-buy clicker. 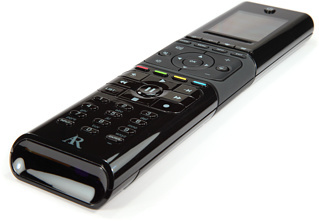 But as we’ve seen with many other computer programmable remotes, onboard programming options are typically quite limited – and even more commonly absent entirely. So let’s see what that software can do! Although the Xsight’s programming works exclusively over the Internet, the supporting drivers and utilities are not Mac compatible and will require a Windows PC. After installing a tiny application from the bundled CD, a single icon loads the system tray monitoring application (which auto-starts with the system) and points your web browser to ar.ez-rc.com. Owners will need to create a user account before they can begin programming. Also required is the installation of an ActiveX component, which itself doesn’t instill much confidence when browser security warnings indicate that it’s “Control name not available” from “Unknown publisher”. After installation the website updates the remote’s firmware if needed and then, at least as my experience went, hung the browser for about 3 minutes until finally confirming that everything was ready to go.